The Areas, Divisions, and Districts they are a changin’! 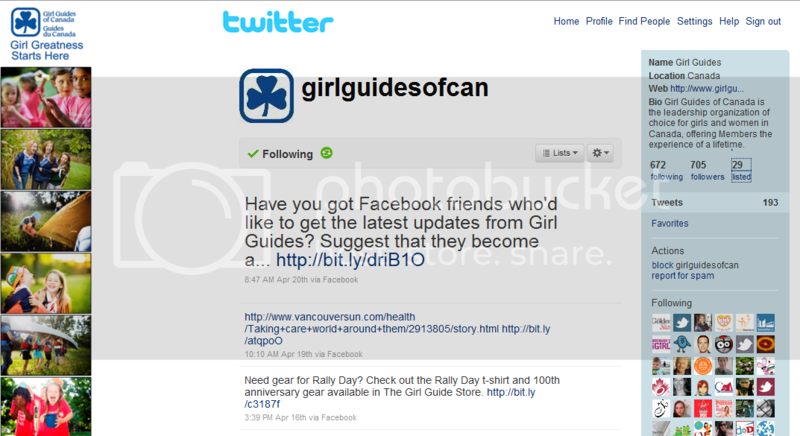 As I’m not a member of the GGC at the moment, I’m not particularly privy to the internal structural changes of the Girl Guides of Canada’s provincial organization system. However, once a chance takes place and becomes public knowledge, I often hear about it. The first (major) structural change that I got wind of happened approximately three years, when the province of Ontario decided to do away with the classic Area/Division/District structure. I would venture to guess that this was a discussion that was not made lightly (at the time Ontario had more A/D/Ds than any other province in Canada) and which had many solid reasons behind it, though I can only speculate as to what those might have been. As many collectors of Canadian patches may know, when Ontario scrapped the A/D/D system, they also stopped producing location specific patches for this province. 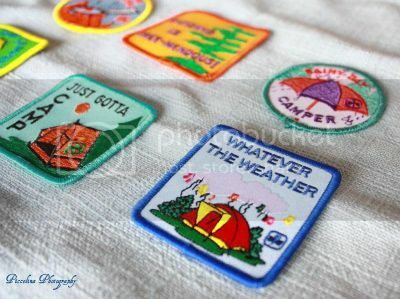 To date, I am not aware of patches (similar to the classic A/D/D ones) being produced for the Communities of Ontario and Nunavut, though I hold onto the hope that they will be at some point (so that both Guiding members – especially the girls, for whom having patches to swap at camps and other events has always been important – and patch collectors alike will once again have something to collect from Ontario). 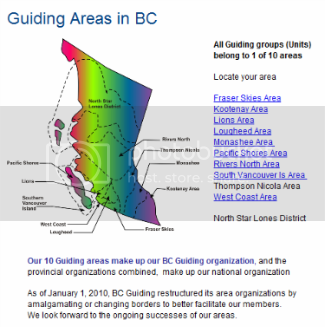 Recently my lovely friend Louise St. Germain brought to my attention the fact that over in British Columbia they've been altering their provincial structure as well. Thankfully however (for the time being), B.C. is still using an Area based system. At the moment, B.C. is comprised of ten different Areas (see image below), and is still has Districts (some of which – such as Fraser Skies - have recently put out some really stellar patches, that I’m sure many collectors will be very eager to try and get their hands on). I would imagine that as the 21st century rolls onward, more and more provinces will be adjusting their Guiding structures to some degree, and think it will be highly interesting to see how such transformations unfold. If you happen to know about any other parts of the country that have changed their provincial structure in a significant way recently, I would love to hear about it so that I could share that information with the readers of this blog (please feel free to contact me via email or in the comment section of this post, if you have such info). As the old axiom says, change is inevitable. Sometimes change is good, others it’s not, but the one certainty of change is that it’s always bound to happen at some point. I’m not against change (though I am do not support the doing away with each province/territory having location specific patches – how could I? :-D), it can be great and help usher in a lot of positivity, which I sincerely hope will be the case for those parts of Canada that have altered their provincial structure. As I know many of my fellow patch collecting enthusiasts also have a broad range of other interests (including reading – which has always been a lifelong passion of mine), I thought that now would be a great time to tell you about a fantastic new book notification service that my husband (Tony) recently came up with. While, unfortunately, there are few books released that are specifically all about Guiding and Scouting, there are tons of books that can be applied to these areas. For example, cookbooks about outdoor cooking work great for those who love to camp and spend time outdoors, whereas craft books can provide tons of interesting ideas to help keep Guiding members of all ages occupied during meetings, sleepovers, and camps. Books about everything from being a team leader to history, sports to ecology and green living can be useful to those involved with Girl Guiding and Scouting - which is all the more reason why it’s super handy to stay abreast of new books that come out on such topics. Luckily, anynewbooks.com can help you do just that. Any New Books? Is an entirely free email notification service that’s here to ensure that you never miss a great new book (on the subjects that are nearest to your heart) again. To celebrate its recent launch and to share this great site with my lovely blogging visitors and friends, Any New Books? and my vintage themed blog, Chronically Vintage, have teamed up to give away a $100.00 (US) Amazon.com gift certificate to one lucky reader! For more details about, and to enter, the $100.00 amazon.com gift certificate giveaway (which will run until Monday October 4, 2010), please be sure to swing by Chronically Vintage. Thank you very much for checking out anynewbooks.com. Please feel free to let anyone you wish (from fellow Guiders to your children’s teachers and librarians) know about this useful new way to stay up-to-date on terrific book release. As those who follow this blog and/or know me from elsewhere may be aware, I’ve been going through a very challenging time with my health this year (well, for much longer than that, but 2010 has been fraught with new issues on the medical front). About three weeks ago I surgery to (hopefully!) aid one of my (more recent) health problems, and remain steadfastly optimistic that I’ll eventually be able to get help for some of the other pressing medical issues that are dominating my life at the moment. But enough of all that drearily serious talk! With the hours of sunlight already getting shorter each day and that familiar zesty nip of fall swirling through the air, there’s no skirting around the fact that (for those in the Northern Hemisphere) summer is gingerly meandering its way to a close. As we slip into the familiar rituals of fall, I am, year after year, struck by the pleasantness of memories filled with childhood Septembers when new Guiding years commenced and once again weekly meetings brought evenings spent intently focusing on such things as badge work, challenges of all sorts, volunteer activity planning, cookie selling, campfires, rousing songs, lessons learned, and friendships formed. I’ve always felt there was an undeniable buzz to September, rich as it is with new beginnings and anticipated events. From school years to the once-again wearing of cozy sweaters, the launch of the end-of-the-year holiday season (which, depending on who you ask here in Canada, kicks off with either Labour Day or Thanksgiving in October) to the autumn harvest teaming with toothsome apples, pears, and early season root vegetables. With the fun-filled frenzy of another summer quickly falling behind us, the upbeat tempo of September gives way to a sort of magical autumnal tranquility. Lingering between the excitement of summer and the whirlwind weeks of December, this time of the year is one of the best in which to rekindle favourite pastimes – and what better hobby to once again dive headfirst into than Girl Guide and Girl Scout patch trading? For those of us still diligently trading patches, the past few years have seen a sharp, ongoing decline in our ranks, but I know that there are still many of us, scattered as we may be around the globe, who are still passionate about this hobby (and/or who are looking to get back into it again). Now, as the cooler days slip into our midst and evenings spent at nestled at home seem inviting once more, why not take some time to reconnect with past swapping partners or to make new ones? Sort through your patch collection (who hasn’t gone to organize their patches before, only to find you had more dupes than you thought? ), spend time sharing your zeal for patch collecting with the younger Guiding members in your life (it’s never too early to get children interested in this rewarding hobby), shot an email to a dear Guiding friend, and enjoy the simple joys that come with being a patch, badge, pin or any other sort of Girl Guide memorabilia collector. Though I know that until my health improves further I won’t be able to spend quite as much time online as I’d ideally like to, my email inbox is always open (and checked frequently). If you’d like to swap patches with me (or simply shot the Guiding breeze), be sure to swing by my Dupes and Traders list, than zip an email my way. For many the first time they pledged the Girl Guide promise – often in front of a group of their fellow Guiding sisters and perhaps others, such as their parents – was a moment they would never forget. There’s something immensely impactful about taking an oath of any kind, but what has always helped the Guide promise stand out is its simple, timeless words that even the youngest member of the GGC can understand and appreciate. I personally love the new promise. In order to make a broader range of people feel comfortable, the words “faith” and “God” are gone, in their place the all-encompassing word “beliefs” appears. I feel this is a wise choice that will hopefully make everyone from atheists to conservative religious Guiding members happy, as it doesn’t tie them to one word pertaining to their personal feelings or beliefs when it comes to matters of faith. Likewise I really like the addition of the line, “I will take action for a better world”. In this rocky era of climate change, economic crisis, and constantly evolving technology, it’s import that girls realize that the changes they make today can have a real impact on both the present and that future. This new rewording holds true to the classic spirit of Guiding, yet has come up to speed with the modern world we inhabit. I believe that it will resonate in the minds of many youngsters who make the Guide promise for the first time now, just as strongly as the words of those of its predecessors do in my own memory.